With a fiber-guided continuous-wave luminous flux of over 150 lumens, the ALBALUX FM white light laser module allows precise, high-contrast illumination even in areas that are difficult to access. This opens up new possibilities in endoscopy, surgical headlamps, and 3D image processing. In addition to brightness, its precise beam guidance and sharp beam edges are also impressive. The compact housing of the plug-and-play module contains specially developed electronics for safe control of the light source. Despite its high optical performance, ALBALUX FM has low power consumption. 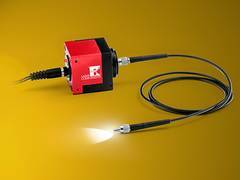 The light source is the innovative laser light technology from SLD Laser. Two semi-polar blue GaN laser diodes (450 nm) illuminate a phosphorus chip, producing a brilliant, incoherent white light that is more than ten times brighter than the brightest white LEDs available. In addition to decades of experience in laser optics, electronics, and fiber optic technology, LASER COMPONENTS has also benefited with this innovation from the mechanical and technical know-how of its manufacturing departments. The ALBALUX FM with fiber output is only the first model in a comprehensive range of products, for the development of which the customer’s wishes and applications are key.